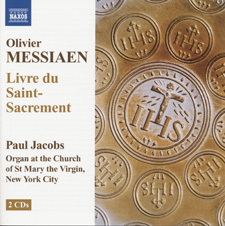 In 2007, Paul Jacobs, chairman of Juilliard’s organ department, performed the complete Messiaen Livre du Saint-Sacrement (1984) to wide acclaim, just in time for the centenary of the composer’s birth in 2008. Now Jacobs has created a thrilling document of his thoughts on the piece, recorded on the very same organ used in that concert, the magnificent Aeolian-Skinner Opus 891 in the Church of St. Mary the Virgin, located near Times Square. (David Crean’s helpful liner notes include a complete list of all the stops on the instrument.) The myriad colors available to Jacobs—some as garish as the church’s neighborhood, others as delicate as a butterfly wing—will probably astonish those new to the piece, and have been searingly captured in the church by engineer Stephen Roessner, a former staff member in Juilliard’s Recording Department. Messiaen’s final organ work was completed as a commission for the 1986 meeting in Detroit of the American Guild of Organists. The 18 movements are based on the Catholic Communion ceremony, divided into three groups: four movements before the ceremony, seven that describe Christ’s life, and seven that refer more directly to the ceremony itself. This is intense fare, uncompromising in its starkness, filled with passages ranging from eerily simple, plaintive chorales, to massive chords whose vibrations could seemingly pulverize the building into dust. The contrasts are everywhere: a quiet meditation like Institution de L’Eucharistie (“Institution of the Eucharist”) is followed by the thundering weight of Les ténèbres (“The Darkness”). Over a span of roughly 100 minutes, Jacobs is astonishing in his control of timbre, phrasing, and dynamic range. Those wanting to hear Jacobs’s artistry in person will have the chance on November 16, when he will inaugurate the newly restored organ in Alice Tully Hall with Part III of J.S. Bach’s Clavier-Übung, one of the composer’s rarely performed works—and overwhelming when heard in person (see Tully Organ Rededicated at 3 Concerts) . Meanwhile, with this spectacular Messiaen recording, Jacobs has created what will surely become a reference version for many. Two of the three works here mine the snap and sophistication of Turkish rhythms and harmonies, filtered through the mind of composer Karl Korte, who studied at Juilliard in the late 1940s and early ’50s with Peter Mennin, William Bergsma, and Vincent Persichetti. 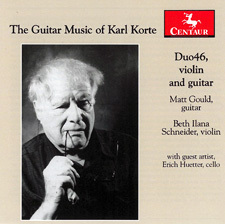 The most explicit Turkish influence appears in Two Makams (2003), one of two works commissioned by Duo46 (guitarist Matt Gould and violinist Beth Ilana Schneider). Found in North Africa, the Middle East and Central Asia, a makam is a centuries-old modal system of tuning, using more than the conventional Western 12 notes to the octave; 17 notes per octave are commonly found in Turkish varieties. The first of the two, marked “Fast,” exploits the violin’s double-stops in a vigorous stomping rhythm, while the second, “Slow,” has the instruments intertwining in curls of relaxation, albeit with moments of tension, especially near the end. Guest cellist Erich Oskar Huetter joins the duo for Evocations (2004), a three-movement work that has a timeless feel, albeit one given a contemporary composer’s gloss. Te Maori uses Maori music transcribed by Mervin McLean at the University of Auckland, Aki (Japanese for “autumn”) evokes the sound of the koto, and Cyprus, the last movement, again deploys the Turkish makam, with its own intervallic and rhythmic relationships. One can almost smell the cumin, turmeric, and cloves wafting through a Turkish marketplace. This and Two Makams were finely captured at Eastern Mediterranean University, located in Turkey’s Northern Cyprus region, where the two musicians taught before moving to Arizona. The most recent work is Virtual Voices (2007), which adds prerecorded digital sounds to the violin and guitar. In the opening bars, Korte has the instruments do a realistic “tuning motif,” with the deliberate intent of disguising the piece’s actual beginning. The interplay between the instruments and tape grows more animated leading to a climactic cadenza—actually two, one for each member of the duo. Gould and Schneider gradually cede to the taped sounds, which move in to close the piece as the tuning motif makes an eloquent return. Recorded in Phoenix, the sound strikes an excellent balance between the live and taped portions, with each carefully judged to confuse the ears—but in a good way.